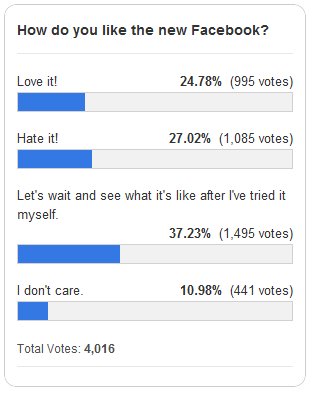 Home Blogger Tricks Free Online Polls HOW TO: Create Online Polls on Blogger? HOW TO: Create Online Polls on Blogger? PollsDaddy.com where you can instantly create online polls for your website. It maintains a dashboard where every poll you created is present with its responses. The free account has some limitations but never the less its very nice. It took me less than few minutes to create a poll. The poll creation is not only convenient but you can also very flexible i.e. if you want to keep the polls for life time then you can actually paste them in posts and make a section of polls where you can refer your readers to older polls as well. This way you can keep old polls forever and also keep the data and votes along with it. This is very useful as you never know which poll will again start showing up in Google searches and you might need them again. The enrollment process is very simple you can also connect using Facebook account. Like I said earlier the free version has some limitations and if your requirement is basic then pollsdaddy.com is really a good option for you. Just check this http://goo.gl/wL9iQ post to get an idea of how the poll looks.